Each flag outside the Curriculum Learning Center represents a country from which a foreign exchange student who studied at North came. 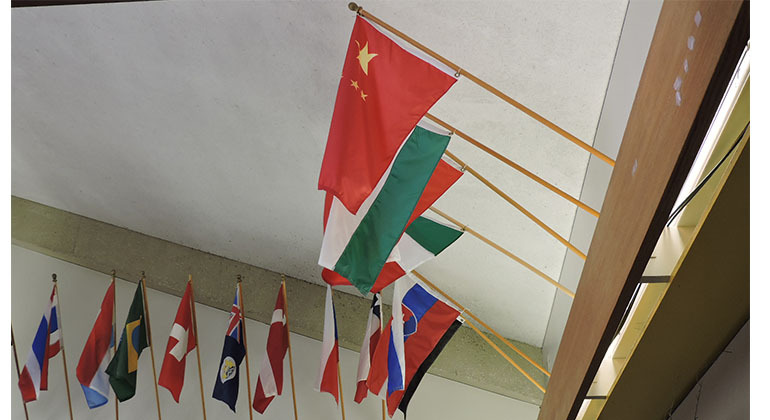 Besides having foreign exchange students, North has many students who are originally from another country or have family members who are from another country. Many students and families including those in the North area will be paying careful attention to decisions related to DACA. On Jan. 19, 2018, President Donald Trump was unable to sign the new appropriations bill due to disagreements regarding the Deferred Action for Childhood Arrivals (DACA) funding, border security, and the increase of military spending, resulting in a three-day government shutdown. The DACA program allows some people who entered the United States illegally as children before 2007 to stay in the United States without penalty if they meet certain criteria; however, DACA is not a legal status. “DACA is a program that has been on the books for quite a while, so people who were brought here as children are now DACA recipients. Normally, when you think DACA you think small kids because that’s when they were brought here, but many of those people are now adults,” said United States Citizenship and Immigration Service Officer Elizabeth Grant. After graduating with a Masters of Business Administration and a Juris Doctor, Grant reviews green card applications, conducts interviews with immigrant applicants, and approves or denies applicants cases. Recipients of the DACA program must provide the government with their current address and other personal information to ensure they are low risk. Working Recipients are required to do this every three years. Not only is DACA termination a concern for recipients, it is also a concern for their family and friends. DACA termination could affect students with family members who are recipients which could include members of the North community. “Students themselves could be born in the United States, but their parents and siblings are immigrants. They could have siblings that are potentially deportable if DACA is lifted,” said Grant. With the increase in focus on immigration, families are beginning to feel the pressure of deportation, especially if they have undocumented family members or family members who qualified for DACA. “A lot of people come to this country fleeing some type of bad situation whether it’s poverty or maybe they’re fleeing for their lives because it’s dangerous,” said math teacher Joslyn Harris. Familial deportation is extremely stressful for adolescents with family members without legal status. “When people that are cared about are deported, it can affect them emotionally and mentally,” said junior Mahde Alkharabsheh. The stress of deportation placed on adolescents can add to the stress of school work and can drastically change their academic habits. “How can you concentrate on your academics when you’re afraid that any day now somebody is going to make you or someone in your immediate family go back to the country they came from,” said Harris.